As a youngster, I used to love a good festival. Camping in close proximity to thousands of other noisy revellers was a rite of passage, and a lot of fun. Comfort, personal space and a good night’s sleep were just not that important when there was partying to be done. Now, as a mother of two young children, I still like the idea of a good festival. But my priorities have changed. I now need ‘comfortable & civilised’ rather than ‘rock & roll’. Don’t get me wrong – as a family, we love camping and have embraced all that it has to offer, from pitching in a farmers’ field with no showers, to glamping it up in geodesic domes and treehouses. But it’s a completely different thing taking the kids to a busy, hectic festival environment, so I was excited to hear about ‘Yurtel’, a super-luxury pop-up campsite that now appears at most of the UK’s best festivals. 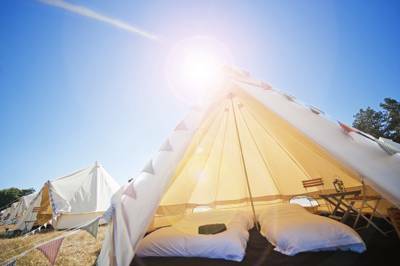 It describes itself as a ‘luxurious and sophisticated festival camping experience’ and boasts an assortment of accommodation including yurts, bell tents and Bedouins. This, I thought, would be the way to gently introduce my young family to festival life – and off we went to The Big Feastival, the Alex James/Jamie Oliver food-and-music-fest in the Cotswolds. From the moment we checked into the dedicated Yurtel reception (complete with complimentary newspapers, bar, chill-out area, umbrellas) the experience was brilliantly boutique, laid back, happy and nothing was too much trouble. We were given a glass of prosecco each and the kids had a freshly-mixed fruit cocktail. This gave them ideas above their station and, as soon as my son clocked the golf buggy, he was determined to be chauffeured in and out of the Feastival site as many times as possible. The dedicated Yurtel field was green and spacious – more reminiscent of a civilised Sultan’s camp than the chaos of crossed guy-ropes in a regular festival camp-field. The wasp that had so rudely followed us into the yurt didn’t get a look-in at the Green & Blacks chocolates delicately placed on our pillows, as the kids ripped them open, and scoffed the lot. They then proceeded to tuck the Yurtel-branded eye-masks and ear-plugs under their pillows, stuffed a wind-up torch in each of their back-packs and set off to chill-out in the cinema tent – a Bedouin affair with scatter pillows aplenty. We didn’t have any rain, but I still felt mildly smug at being ensconced in this cosy, clean and civilised retreat as I drifted back, momentarily, to festivals of old: soaked to the skin, queueing cross-legged for a barely-usable loo, with a hot-shower but a distant dream. By contrast, here I was staying in a sanctuary – a pristine “tent” with a lockable door and not only space to stow my clothes, but a bedside light and a plug socket to charge my phone. In the morning, I was able to saunter over to the edge of the field, just metres from the tent, and step into a lovely hot shower to beautify in total peace and privacy. And had I been so inclined, I could have stepped into the 'Boufantery', to primp and crimp my hair to my heart’s desire in front of a huge gilt mirror. Of course, ‘civilised’ is a relative term in the camping world. Just because you’re sleeping in a king-size bed with crisply laundered white linen and fresh flowers on your bedside table (oh yes), doesn’t mean that you won’t hear the sounds of fellow glampers. I was awoken to the sound of a nearby parent 'whispering' loudly through gritted teeth, suggesting that their off-spring might like to "BE QUIET" and go back to sleep. I must admit to slightly regretting the previous evening’s nightcap by the campfire at this particular stage in the early morning. But I grabbed a pair of ear-plugs, snuggled back into my feather pillow and waited for my husband to bring me a cup of tea and a freshly baked pain au raisin, safe in the knowledge that my kids were nestled happily in the cinema tent, watching Despicable Me for the 10th time. If it wasn’t for the Aperol spritzers the night before, I’d no doubt have felt as refreshed as staying in a boutique hotel. Maybe there is still a bit of rock & roll in me after all! Yurtel will be at various UK festivals during 2014, including Glastonbury, Bestival, Latitude and V Festival. Prices for up to 2 adults and 2 kids for the duration of the festival (three to four nights depending on where you are) range from £400 for a baby-bell tent, to a yurt at £1350. Facilities at most festivals include a dedicated indoor and outdoor chill-out area, a cinema tent, a sit-down restaurant, and a spa with bookable treatments.